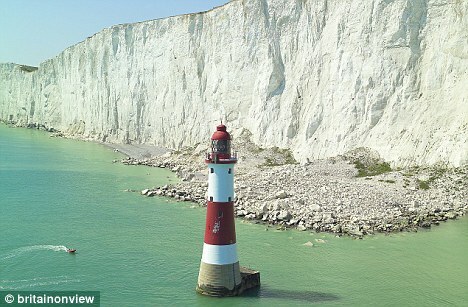 The purpose of the wide red band was to make this light tower backed by the large white cliffs more visible as a daymark and in conditions of less than optimum visibility. In 2010 this light was included on a list of several lights proposed to be discontinued to eliminate the costs to operate and maintain, including painting, To compensate the intensity would be increased at the nearby off-shore Royal Sovereign Lighthouse, much easier to maintain for having helicopter access. As a result of user consultations it was decided not to discontinue Beachy but instead illumination was changed to LEDs to reduce reduce costs. This reduced the range of visibility from 26Nm to 8Nm. The fog signal was discontinued. With the GLA decision regarding Beachy as an example the USCG could save significant money by not painting Cape Lookout, Bodie, and Cape H.
Over 2000 people support the project (previous link) but only "almost £3,000" raised to date. How very typical of many lighthouse projects. Verbal support is nice but it does not buy paint. They can hardly be called supporters if they're not willing to donate money. Probably most of these supporters are visitors to the popular park area above the lighthouse. The cliff the highest chalk sea cliff in Britain, rising to 162 m (530 ft) above sea level. It's like, "Oh hey, there's a lighthouse. Sure, I like it."